2011 Upper Deck Goodwin Champions has been unleashed upon the world and promises to have the strangest mix of cards on the market, at least until 2011 Allen & Ginter Baseball comes along later this month. From wild base cards to bugs to manufactured patch cards of endangered animals, 2011 Goodwin Champions has a lot of, well, interesting aspects. While the set won't be for everyone, there is much to appreciate in the image selection department. The majority of cards today use similar shots that, quite frankly, can bring on boredom faster than a bad high school Earth Science teacher lecturing on tectonic shift. Goodwin Champions goes in a different direction on many base cards, capturing athletes in unique action shots and captivating portraits. The fact that they're paintings instead of the more standard photographs further helps the cards stand out. This theme of memorable pictures carries over into the autograph set. Here's ten of our favorites measured not by their value (sorry, Michael Jordan, Tiger Woods and Wayne Gretzky--80s hair wings and all--didn't make the cut) but rather the interesting stories they bring. This card isn't notable so much for the picture, however cute, but rather the signature. If I pulled one, the geek in me would want to scream about getting Han Solo's autograph. Look, it's the PGA's newest star. Wait a second, isn't Tony Perez a baseball player? This card isn't fancy but it catches you off-guard because it's unexpected. The pose with the mittens and snow is almost cliche. It can be spotted in nearly every winter catalog. However, the colors and cropping make this card striking. And let's face it, Bleiler isn't tough on the eyes either. Fisk maintains the man quotient, rocking the timeless red and black flannel sweater. 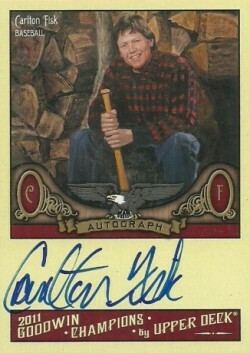 Resembling a frightening mix of Mr. Rogers and John Denver circa the late 1970s, this card is a fantastic time capsule portrait of one of baseball's greatest catchers. Can a man fly? In this shot, Olympic Gold Medal diver Greg Louganis suggests it's a possibility. This picture is a thing of beauty. The cropping offers no hint of a diving board to launch him. Louganis' face is calmer than the rippling swimming pool below him. 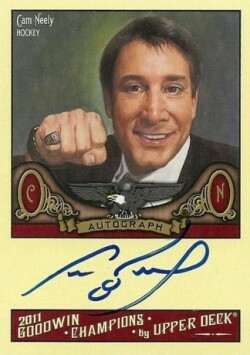 A nice signature caps off a gorgeous card. During his Hall of Fame career, Cam Neely could drop the gloves with the best of them. He also had the ability to make him much more than a goon enforcer. Fist raised, jovial smile on his face, this card shows both the sweet and the sour of Neely. If ever there was a card that showed the many public sides of David Robinson, this is it. 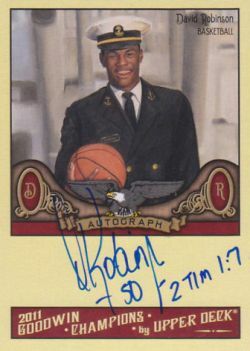 "The Admiral" is decked out in his freshly pressed Navy uniform holding a basketball and giving the world an All-American smile. The Biblical inscription cements Robinson's image as the role model athlete almost every grandma would want to make meatloaf for. What do you think the chances are that Billy Sims is a proud Texan? 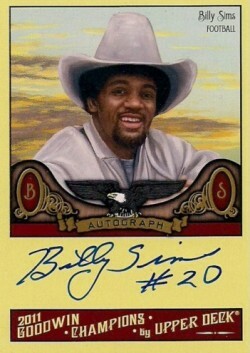 As big as the smile is on the 1978 Heisman winner's face is, it's the massive cowboy hat teetering on top of his old-school Afro that really grabs the attention of the card. Sorry, Mr. Sims but you just been out cowboy-ed. 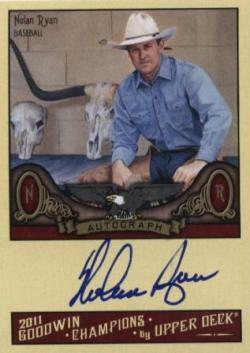 Nolan Ryan not only has the hat, but he's got the brown leather chaps on and the skulls hanging on the wall in the background. Will there every be a card as tough and rugged as this? Had Ryan not been pictured in a similar hat on an autograph card just weeks earlier like he was in 2011 Leaf Pop Century, this likely would have taken the top spot. 1. 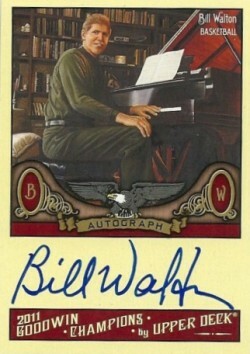 Bill Walton, Classic Pianist? Great portraits capture the essence of its subject. Plenty of shots of Bill Walton playing basketball whilst showing off his classic Sasquatch beard line the image archives. This card shows the exact opposite of the player turned pianist. Clean-cut, nicely dressed and sitting tall, Walton looks more ready to jam with Yo-Yo Ma than battle with Dr. J. It's this contrast of past and present that makes it so memorable and the best card, appearance-wise, in this 84-card set.